Google Shopping Actions doesn’t have a cost per click because it instead has a cost per sale. The Google Shopping Actions commission fees range from 2-20%, averaging 12%, but this is a huge departure from Google Shopping because Google is effectively mitigating a lot of the risk. 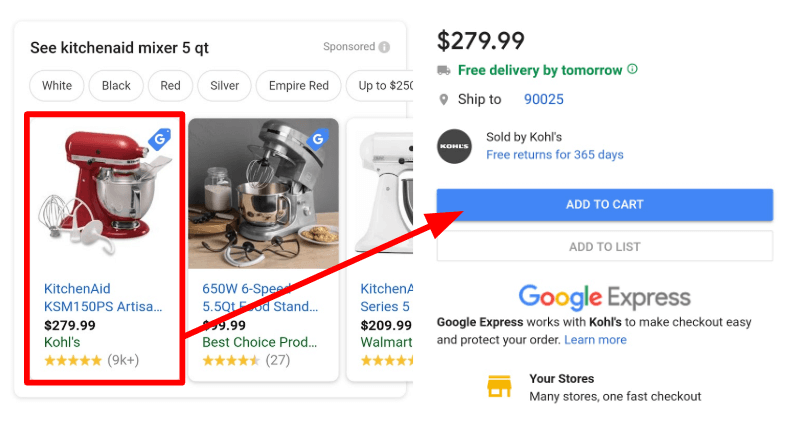 A click on the Product Listing Ad (PLA) will take you to Google Express, where a buyer can purchase the product. Kohl’s does not pay for clicks, they only pay commission when a user purchases. Google’s algorithm chooses whether to surface a PLA for Shopping actions or Google Shopping.